We divided our 2018 outlook into four self-standing commentaries. This first commentary focuses on the overall economy. The second examines the impact of tax reform on 2018 and longer-term. Then the third commentary looks at the Fed’s policies and organizational changes. Finally, our fourth commentary offers our investment summary and conclusions. This year, 2017, will be judged as a good one for the economy. G.D.P. for the second quarter grew at a 3% clip. Moreover, the government just raised its “second estimate” of third quarter G.D.P. from 3% to 3.3%. The recovering oil and gas industries contributed an estimated 60% to the economic growth shown so far this year. Our past commentaries showed evidence supporting expectations for a strong holiday shopping season. In line with that, the Atlanta Fed cites blue chip economists’ forecasts averaging 2.7% growth for fourth quarter G.D.P. Both the New York and Atlanta Feds’ forecasts call for even higher growth averaging about 3.5%. If fourth quarter G.D.P. growth comes in at 3% or better, it would mark the first time since 2004 that the economy grew at that level or higher for three consecutive quarters. In addition, the fourth quarter momentum should carry into the first half of 2018. One caveat, each year, initial first quarter G.D.P. estimates from the government tend to show disappointing results. This anomaly results from quirks in the government’s seasonal adjustment calculations. Even without tax reform, muted but positive economic growth will likely result in 2018. At the same time, with no notable signs of economic excesses, there seems little reason to expect an economic slowdown during the upcoming year. Most economists expect 2018 economic growth to come in around 2.5%. If tax reform passes, there will be upside risk to those forecasts for reasons we cite further in our commentaries. Important to the domestic economic outlook in 2018 will be U.S. export growth. Expected global economic growth of about 4% in 2018 compares to an estimated 3.7% this year. With increasing global economic growth next year and the likely continued weakening of the U.S. dollar, stronger U.S. export activity should result. In addition, a declining dollar benefits U.S. global corporations when they translate their international earnings into dollars. A recent international monetary fund study showed the strong influence of the U.S. dollar on world trade. That study concluded the strength of the U.S. dollar—it labels the dominant currency-- provides a key predictor to aggregate world trade volume. That study showed a stronger dollar, leads to a decline in world trade. We suspect the opposite case will also prove true as the dollar weakens. Lagging inflation poses a “mystery” to quote Fed Chair Yellen. A recent study from the Federal reserve bank of San Francisco provides some answers. Their study points to modest price inflation in acyclical categories that tend not to be sensitive to overall economic conditions. 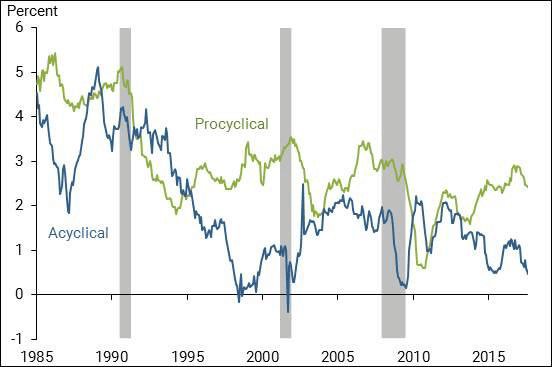 In comparison, the study shows procyclical price inflation returned to pre-recession levels. In their study, procyclical categories comprise 42% of personal consumption expenditures (P.C.E.) compared to 58% for acyclical categories. For reference, acyclical categories include health-care and financial services as well as clothing, transportation, and other small categories. The following graph shows the P.C.E. inflation for both categories. Health-care services represents the most important category contributing to low acyclical inflation. Most consumers looking at their medical insurance premiums would find it hard to accept that result. That category contributes about 35% of acyclical inflation and 20% of the entire P.C.E. core index. Health-care services contributed the major drag to low acyclical inflation. Without the drag from health-care services, the study suggests core P.C.E. inflation would range slightly above 2% for the post-recession period. Reduced growth in Medicare payments contributed to this slower inflation. Possibly this may show a small uptick. The study indicates that inpatient Medicare payments will increase from 0.6% in FY2017 (ends Sept. 30) to 2% in FY 2018. So far this year, overall annual wage increases total 2.7%. Even stronger growth of 3.4% shows up in the Atlanta Fed’s wage tracker. In our opinion, wage increases will continue to strengthen. This will result from a combination of the continued recent economic improvement accompanied by historically low unemployment rates. Over the last 12 months, in comparison to these levels of wage increases, the consumer price index increased only about 2% and 2.5% for the F.R.B.S.F. procyclical core P.C.E. inflation. We expect businesses to move aggressively to protect profit margins by raising prices. The recently improved economic growth rate gives more of a window for such price increases. Improving Capital Spending—A Strategic Change? Tightening labor markets may also force businesses to substitute capital for labor to improve their productivity. Tax reform changes will also encourage such capital investment. Even without tax reform, capital spending seems to be accelerating. So far this year, capital spending increased over 7%. This represents the fastest growth rate in three years. Further evidence, in October, nondefense capital goods spending showed its ninth monthly increase in a row—the first time since 2004. No doubt, increasing capital-spending improvement comes as the business cycle moves through its maturing phase. Nonetheless, tax reform’s provisions for stimulating capital spending should extend the current capital spending cycle for some time. The next graph shows the Philadelphia Fed index that forecasts capital spending for the next six months. Last summer this index reached its highest level in 30 years. Perhaps increased capital spending will finally lead to improving the decade’s lethargic U.S. productivity levels.